It's a new day in fashion, Phoebe left, Hedi came and Versace was sold: very few things have stayed the same and that includes the one hundred and 62-year-old London staple that is Burberry. Riccardo Tisci was brought into the British fashion house back in March, succeeding Christopher Bailey as chief creative officer, most-likely to give the label a new life, making it more appealing to younger demographic. However, the Italian native's approach was slightly different than expected—although the revamping of the Burberry logo was quite predictable—opting for generational view of fashion, creating collections that could dress a mother as well as her daughter, both a father and his son (although they weren't posted on this review, Burberry did show their men's and women's collection together) as opposed to the dark sensual palette he was known for at Givenchy. It's this idea of maintaining Burberry's image as a family brand whilst tailoring it to today's consumers: allowing them to share the experience of shopping together and creating memories instead of passing down a trench coat through the family, through generations eliminating the wait and fulfilling the recent see-now buy-now runway trend. Critics argue that this new approach minimizes the prestige associated with the brand, taking away from its heritage and classic designs, ultimately falling into the logo-mania craze as an attempt to please millennials. It seems that LVMH (Burberry's parent company) has quite a few rebranded subsidiaries under their belt like Celine with Kering's Hedi Slimane or even Christian Dior and Givenchy in recent years. This brings up the following questions: how does a long-standing brand adapt to a new era and how has the relationship between luxury groups/fashion labels and their consumers changed today, in 2018? While the general concept of the new and improved Burberry was interesting, especially when analyzing the way it relates to modern consumerism, Tisci's second show for the label felt a bit redundant to say the least, echoing many traits from Bailey's Burberry as well as his previous show. It is true new comers must develop similar designs season after season to establish themselves in their new role, however I do feel that most of us fashion lovers were waiting for something more "Riccardo" given his success at Givenchy. 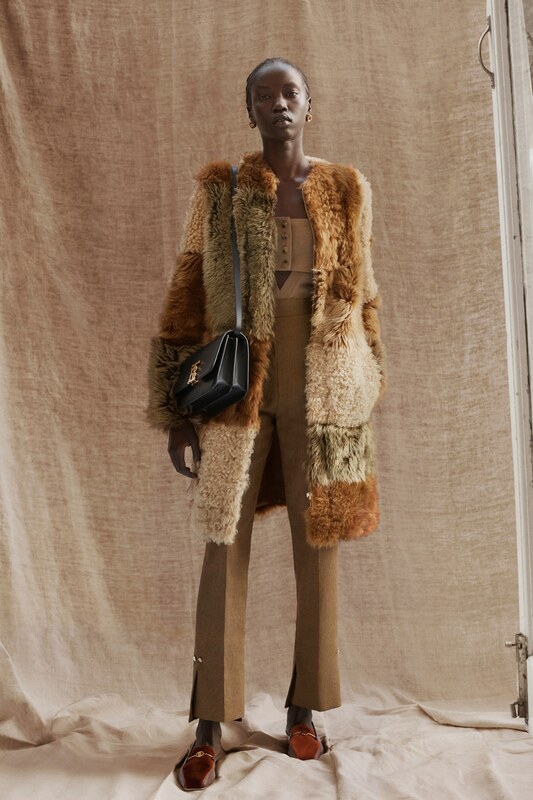 The softer palette and materials were fine but didn't stand out, although the pre-fall collections aren't as important as say the fall/winter or spring/summer lines since they're composed of, mostly, transition pieces. I was able to catch a glimpse of the Riccardo I know and love in his younger designs, the darker color palette, the all-black looks and to quote Fabiola Beracasa (now Beckman, a Venezuelan film producer who's wedding dress was designed by Tisci): "The lace, oh the lace! ", which was absolutely stunning on a white mini dress as well as the embroidery featured on a sheer black dress. The animal prints and fanny-packs were a miss for me as they felt like Riccardo working under free-market capitalism—if that makes any sense. I really enjoyed the puffy scarfs with the new logo printed across and the beige body con dress with a cutout poplin shirt, loved the shoes as well; very British. My favorite look of all had to be the off-the shoulder black sweatshirt with the white t-shirt sticking out and the printed denim skirt. Riccardo Tisci has a promising future at Burberry. It is a hard situation to navigate as he is having to please the label's existing clientele, the fans that have migrated with him from Givenchy and a new wave of consumers drawn to the fashion house due to this collaboration itself. The improved marketing strategy where the family-oriented brand considers all demographics is, in my view, genius as it takes advantage of the company's heritage whilst reflecting consumerism today. Burberry is in an exciting time, not only for them but the industry as a whole, unlike other designers (hint hint Hedi Slimane), Riccardo is attempting to reconcile multiplicitous factors and forge the future of fashion. Like me, Luke Meagher (IG: @hautelemode) and others, worried about the lack of cohesiveness in Riccardo's first show for the house. This one was better, however not quite there yet. That's the exciting part! I hope you've enjoyed reading this review, I had fun writing it! Whether you liked it or not I would love to hear your thoughts. Let me know if I should try answering/analyzing the two questions I posed earlier. Have a blessed day!